SASKATOON, Saskatchewan, September 13 - Pitts Special biplane CF-AMR, a veteran of many air shows across Canada and the U.S., begins its final flight this weekend when it departs Saskatoon for Ottawa. Its destination: the Canada Aviation Museum, where it will join an internationally renowned collection of historically significant military and civilian aircraft. AMR is the last remaining original aircraft of Canada's Carling Red Cap aerobatic team and its successors, the Canadian Reds and the Ray Ban Golds. Anyone who saw any of these teams perform at air shows (approximately 1974 to 1990) has seen AMR in action. These were Canada's only civilian aerobatic teams, and AMR was part of all of them. Because of this aircraft's significance in the history of Canadian aviation, the Canada Aviation Museum has declared it a national treasure. Current owner, Saskatoon pilot Dave Gillespie, bought AMR after the Ray Ban Golds disbanded. Over the past several years he has flown it in aerobatic competitions and some air show displays and is now donating it to the Museum. "I am planning a departure from Saskatoon Saturday or Sunday, the 14th or 15th," Gillespie says. "From there on it is anybody's guess as the weather's really goofy lately. Nav Canada, the US weather service and EU weather reporting all disagree over next week's forecast! 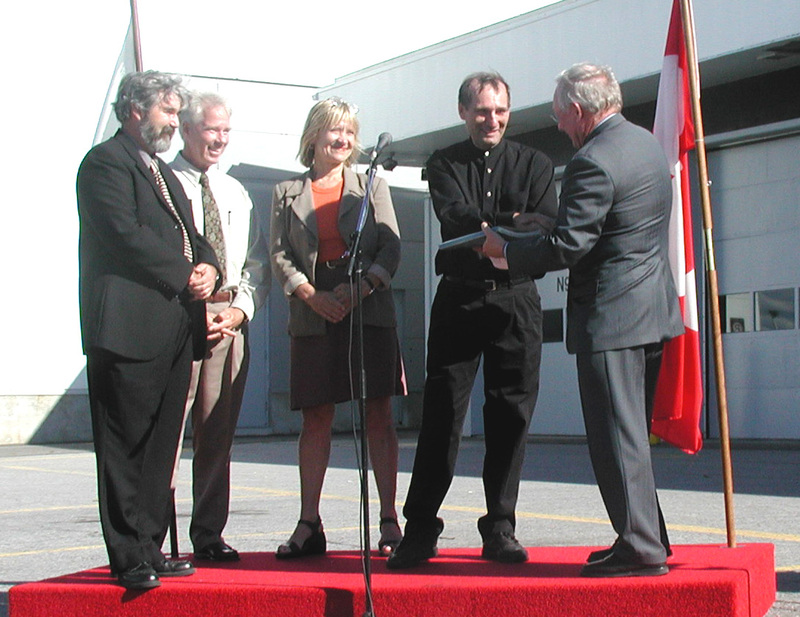 Gillespie will formally present AMR to the Canada Aviation Museum on Monday, September 23. Both of the aircraft's former owners and pilots, Debbie Gary (Carling Red Cap team) and Bill Cowan (Canadian Reds and Ray Ban Golds) will be on hand for the ceremony. CF-AMR, a modified Pitts Special S-2A, is a veteran of the Canadian and U.S. air show circuit. It is the only remaining original aircraft from Canada's Carling Red Cap aerobatic team, which was succeeded by the Canadian Reds, then the Ray Ban Reds, and finally the Ray Ban Golds. Debbie Gary, still active in air show flying, then a member of the Carling Red Cap Team, took delivery of CF-AMR at the Pitts factory in Wyoming in 1973. 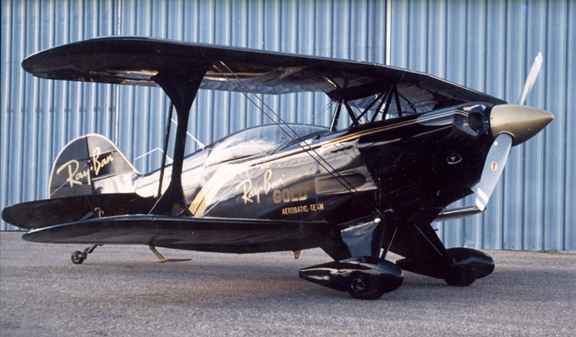 Bill Cowan, then a pilot with CP Air and one of two original members of the Canadian Reds aerobatic team, bought AMR from Debbie Gary in 1975. The Canadian Reds team was sponsored by Skil Tools. Later, Bausch & Lomb Incorporated sponsored the team. In 1983, the team became known as the Ray Ban Golds after a new line of sunglasses produced by the company. Dave Gillespie, Saskatoon pilot and Creative Director at a local advertising agency, bought CF-AMR from Bill Cowan in 1995. He flew the plane in aerobatic competitions and air show displays. AMR still wears the distinctive black and gold colors of the Ray Ban Golds. This is the way it will be displayed in the Canada Aviation Museum. André Lortie, former Snowbird lead pilot and currently a lead pilot of the Northern Lights flying team, saw CF-AMR at an air show not long after Dave Gillespie purchased it and told the new owner, "Hey, that's the airplane that got me involved in aviation." Seeing the aerobatic team in action inspired him to give up his job as an auto mechanic, join the Armed Forces and become a pilot. Chris Hadfield, Canadian astronaut, remembers seeing AMR perform both as a Canadian Red and a Ray Ban Gold. In an e-mail to Dave Gillespie, he said, "The tight, hard, strong capability of the Pitts, coupled with the smooth, confident flying skill of the pilots created undeniable visual evidence of what people can do when they set their minds to it." Pitts Special biplanes, with their exceptional aerobatic capabilities, were designed by Curtis Pitts, a legend in civil aviation circles. The first Pitts Special, a single- seater with 55 hp, first flew in 1945. AMR, a later, two-seat, trainer design, was built with a 200-hp engine. Bill Cowan had it modified by the factory, upgrading it to 260 hp. Flying it is "like holding a wildcat by the tail," says Dave Gillespie.